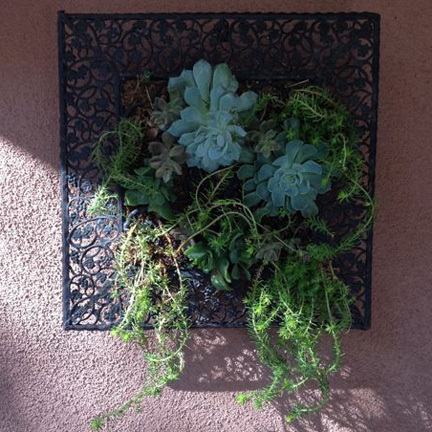 Are you crazy about succulents? I am! They are so beautiful and versatile – and really easy to work with. I’ve created many potted succulent gardens, including a fairy garden. Also, I have really enjoyed propagating the little “babies” and using them in other arrangements, delighting in the fact that no purchase was necessary. I keep a whole area set aside as my mini nursery for all the little ones that pop up in other planters – and grow my own new ones for future projects. A while back, I had this flash of inspiration when I came across some black decorative metal wall hangings that I had grown tired of. They were in the back of a closet, waiting for the donation truck – or some other similar fate. They had some really pretty spaces and it occurred to me that perhaps I could create a succulent wall hanging using these as the framework. I really like the look of living wall art in outdoor spaces. It took a while to carve out the time and figure out how to make it all work, but finally one weekend that I was feeling particularly energetic I did it. This is how I did it, but improvise as necessary ~ heck, I made this up as I went along! 1. Measure to figure out how large the base of the hanging needed to be. Create a 1 ½” deep basket out of the wire mesh. To do this, take the size of your desired base and add 3” total both horizontally & vertically. 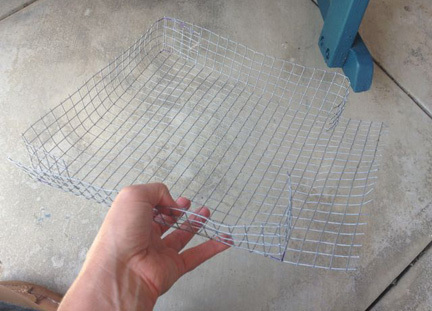 For example, if you want a 12” x 12” base basket, cut out a square in the wire mesh that is 15” x 15”. 2. From one corner of the mesh, measure 1 ½” along the edge, then cut in towards the center of the square 1 ½”. Do this on the remaining three sides. Fold the sides up and flap over the corners. Use the gardening wire to hold the corners in place. You should now have a wire basket. 3. Line the wire basket with coconut basket liner. Mine was a funny rounded shape intended for a window box of some sort, so I had to cut it and shape it to line my basket. 4. Fill with cactus/succulent soil. 5. Add a layer of peat moss on top of the soil. 6. 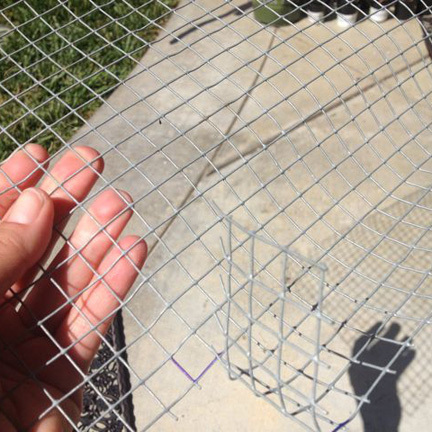 Cut a piece of wire mesh that is the same size as the bottom of your basket. Cover the basket with mesh using the gardening wire. 7. Securely attach your finished basket to the metal wall art. 8. Now for the succulents! Arrange your succulents as desired. I really like to see some draping off the bottom, and try to have a few succulents that really pop – either more red or yellow in tone than the rest. I am really happy with how they turned out. I’d love to create a larger version – and I have two more larger metal wall art pieces that might work perfectly!